Getting a quote over Internet or fax. 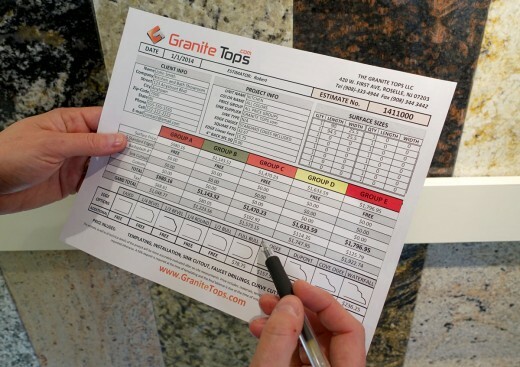 Send your layout along with your contact information to: info@granitetops.com or fax it to: 908-344-3442. We will respond promptly with an estimate with pricing options for different groups of stones (standard, premium etc). Visiting us in person. Stop by our location in Roselle NJ with a layout of your project to see the stone selections, discuss all the details of your project and get a quote on the spot. This way you may also reserve specific slab, get advice on your kitchen or bathroom design, order a kitchen sink directly from us etc. We are open 7am-5pm Monday to Friday and 8am-3pm on Saturday. Drawing a layout. If you don’t have the exact designer/architect/contractor drawing for your project, rough hand- drawn shapes of the cabinets and length measurements are enough to get an estimate. 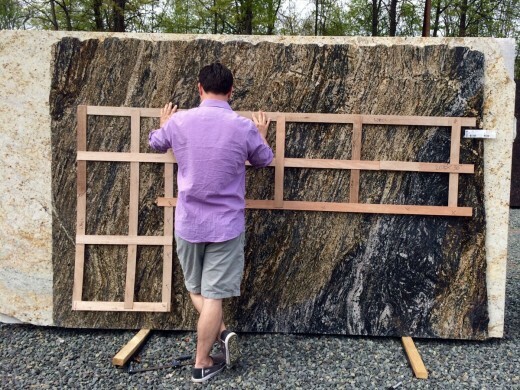 Later on our professionals will take exact template measurements directly at your place before any stone is cut. Try to measure the length of each cabinet run by the wall and think about all the appliances you want to put in place, backsplash etc. The best way to select your favorite stone is to see it in person. We invite you to visit our showroom and on-site stone yard filled with hundreds of granite and marble colors. When you first come, we will show you large-sized granite samples in our showroom to determine the color pallet you are after. Then we will narrow down your selection in the yard looking at full slabs of granite or marble. Our slabs are displayed in a way that makes it easy for you to see the whole slab and be confident in your selection. 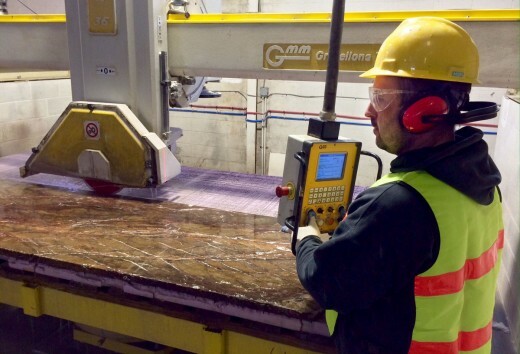 When you decide on a specific slab, we will reserve it for you and put it on hold until the final measurements are ready and fabrication can begin. If you need more time to consider your choices, we can give you sample(s) of the stone(s) you liked to take home and you may come back another day to make the slab reservation. Next-day templating: Just give us a call when you are ready for us to come and measure your project and we will schedule a technician to come to you on the very next day! That’s right – there is no waiting time for the measurements and we will be equally quick to fabricate and install your countertops. All the Cabinets need to be fully installed. All the Appliances must be on site; that includes your fridge, dishwasher, stove and cooktop. Sink(s): The Sink must be on site or in some cases already installed. You can buy a sink directly from us, in which case you need to know the model number to confirm with our technician on site. If you have a cast iron or porcelain farm sink, it should be mounted by your cabinetmaker on a support, so it is already in place when our technician comes. Demolition of the old countertop: If you want to replace a countertop without changing the cabinets, the demolition of the existing old countertop should be completed before we come to take measurements. We may also do it for you for an additional charge. Stone Selection: Unless you already reserved the stone slab on our yard, the sample of your final stone selection should be on site so we could take it with us to verify your color selection. You can also come back to our yard after the templating is complete to double-check the stone selection or to make the slab reservation. The deposit: In order for us to begin the templating and fabrication of your stone, we will need a 50 percent deposit. You may pay in the office before the templating or at the latest hand it to our templating technician on the jobsite. Additional decisions to be made at the time of templating on the jobsite: Our technician will create a template of your cabinets so we can cut the slab(s) with outmost precision and full consideration for custom details of your project. In order to do it right, the technician will ask you questions and make notes of your decisions about the edge detail, seam locations, corner radius and designs, overhangs on the breakfast bar area, sink mounting method etc. If you are not familiar with some of the concepts and options, the technician will guide you through by showing samples of the edging or photographs and drawings of the design options. Before we start fabrication of your countertops we will look at the measurements taken by our templating technician and compare it to your initial estimate layout to make sure that the square footage, edge lengths etc are the same. The price may be adjusted accordingly in case there are differences. We will confirm the edge detail and your final color selection. If you selected granite with lots of pattern, contrasting veining and color variations, we encourage you to come back to our yard so we can take your templates and mark them against the slab(s). We will usually have your countertops fully fabricated and ready to install on the third day after the templating. Again, the final balance needs to be paid in the office or at the latest at the jobsite the day of the installation. When scheduling the installation we will give you a few hours timeframe of when our installing team will come and begin the installation process. While on the jobsite the team will install your countertops, attach the sink to the granite and drill the holes for the faucets. They will also apply a heavy-duty granite sealer. At the end of the installation you will be able to inspect your new granite countertops and ask our installing team any questions about every day use and maintenance of your new countertops!